What Personal Information Do You Want Private? The past few days I had an opportunity to travel to Cairo, Egypt, to present and participate in the 2017 EduForum Conference and also do a little sightseeing. Since sharing my second TEDx talk in November 2016, “Digital Citizenship in the Surveillance State,” I’ve continued to read and research about data privacy issues especially as they apply to smartphones, laptops, and international travel. As a result of that research as well as frequent conversations on “The EdTech Situation Room” with Jason Neiffer, I learned a number of things in the weeks leading up to this trip as well as on the trip about privacy and surveillance that I’d like to share. In addition, this was my first trip to leave all my Apple and iOS devices at home, instead traveling with our family 11″ Dell Chromebook ($200) and a Motorola 4E Plus (4th Gen) Android smartphone ($146). My primary reasons for making these hardware changes for this international trip were security and privacy concerns. If you have questions, feedback or suggestions on any of the lessons I outline in this post, please leave a comment below or reach out via Twitter to @wfryer. Disclaimer: I am not a lawyer, and none of the lessons learned or ideas shared in this post should be construed as legal advice. While it’s quite easy to make yourself paranoid these days reading about the rapidly advancing technological capabilities of governments, corporations and even individuals to surveil and monitor citizens as well as travelers, it’s also important not to discard cautionary tales and recommendations by security experts when it comes to data contained in our smartphones and other computing devices. While many people may think “I’m not a criminal or a terrorist, and I don’t have anything to hide,” the reality of data hacks and their increasing frequency means that if all your smartphone data is copied by customs officials in the United States or another country, there are no guarantees that information will remain secure and protected. Everyone’s situation can be different with respect to data privacy, but here are two reasons I decided after much deliberation and study to limit the personal information I traveled with and which could be subject to electronic copying and archiving if customs officials in any of the countries I visited chose to conduct a forensic analysis on my smartphone or laptop. Once your personal data has been downloaded and copied, like all your contacts or every email message you’ve sent or received that’s still archived on a cloud account like Gmail, there is no way to “get that genie back into the bottle.” Like any kind of digital information, once a copy is “out in the wild” you’ve lost control of it and cannot guarantee whose hands it will or will not fall into. Our family (and many teachers at our school, incidentally) uses/use password manager software now to keep a digital list of important numbers. These include banking and financial information, which we don’t want others accessing. Some people who have private or limited social media accounts on platforms like Facebook and Twitter may also want to limit government access to their accounts, since officials may not have the ability to view/browse all social media posts and interactions without physical access to a logged in device or the account’s login credentials. This wasn’t an issue for me at this point, since my profiles are public. Used “travel mode” in 1Password password manager software to designate a single, limited “vault” of passwords as accessible from my smartphone, and delete all the others so I literally did not travel with that information on my devices. Used a secondary Google account on my Chromebook as well as Android phone, which does not have very many contacts in it but has had some activity. As one of the previously linked articles above suggests, you want to keep a ‘low profile’ going through customs and not draw attention to yourself. If you’ve wiped your smartphone, for instance, this could be a red flag to officials that you have something to hide that they would be interested in. Since I had both my primary and secondary Google accounts on my phone, I was able to delete my primary accounts from both my Chromebook as well as my smartphone when I was still on the airplane before entering the airport terminal and going through passport control / customs. It turned out to NOT be an issue for me on this trip, but if I’d had to hand over my devices for inspection they wouldn’t have been erased/wiped, they would still have an actual Google account on them which I use and has data activity. Backed up / exported all the Google Contacts I had on a secondary account, as well as all my Apple / iOS iCloud contacts as a “vCard file” which I could readily import into Google Contacts for my main account. I learned in this process that Google Contacts features a generous undo/restore feature, so if you mistakenly delete or otherwise mess up your contacts, you can restore them to an hour before, or other time intervals. Google Contacts also has a great duplicate removal wizard, which is VERY handy. It’s a very good idea, from a security perspective, to setup 2 factor authentication on as many of your web accounts as you can. If you opt to use Google’s authenticator app, however, it’s not a quick process to migrate over to another phone or setup those authentication options on another phone. If your financial situation can support it, for instance, I recommend purchasing a less expensive and globally compatible, unlocked Android phone instead of traveling with a locked iPhone. The Authy app is a great alternative to use instead of Google’s Authenicator app for either iOS or Android, since Authy can be installed on any device and then users can just login with account credentials to access all 2FA codes. That’s NOT how the Google Authenticator app works now, so I definitely recommend Authy. It minimized my data privacy footprint relative to my Apple laptop with everything in my iCloud account, especially since I deleted my primary Google account from it before clearing customs. I’ve been sharing all my conference presentation resources via Google Slides and Google Sites for several years now, so I was able to make tons of changes and additions to my EduForum slides and session resources during my airport layovers and international flights using the Chromebook. The long battery life of the Chromebook (about 8 hours of no-kidding full-on use) is just fantastic compared to my other Apple portables, and this was especially helpful in a country like Egypt which uses a different electrical plug because electrical converters weren’t readily available in all our conference rooms. The Chromebook was light and small, which made it a pleasure to travel with and carry. Relative to my Mac laptop, the Chromebook required fewer cords and peripherals that I needed in order to “be prepared.” I brought a HDMI to VGA video connector, a microUSB to USB cable, and a USB-A to USB-B cable. That’s a lot less than I usually carry to be ready for a different array of Apple laptop connection needs. Pro HDR X has been my favorite iPhone photography app for a long time, so when I started using an Android phone I was excited to learn the same company makes Pro HDR Camera for droid users. Many of the most compelling photos from Sunday’s sightseeing adventures in Cairo were taken with this app. I highly recommend it, whether you’re an iOS or Android phone user. One of my oversights for this trip was not checking the expiration date of my credit card. I hadn’t used one that I brought in a long time, and I didn’t even think to look… So add this to your departure checkist. If U.S. customs procedures remain as they are today, most of us may not have to worry about or experience this scenario of having the entire contents of your smartphone downloaded and copied into a government database. As those articles highlight, however, “the times they are a ‘changin” and the trend lines are for customs officials to examine, ask for, and even download/copy more digital information. It’s definitely valuable to consider these questions in advance of an international trip, so you can limit the information you bring with you and the potential information you could give up to officials if asked to surrender your digital devices. I also used Quik (from GoPro) to create a highlights video from our Nile dinner cruise set to some copyright-friendly music readily available in the app for free. It’s perfect for creating short summary videos like this. 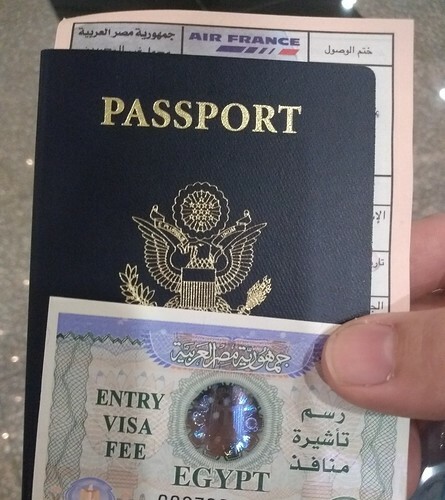 For the first time, since I’d read all these cautionary articles about cell phones and customs officials before this trip, I turned my smartphone and laptop off before I entered the customs line both entering Egypt and re-entering the United States. This was apparently unnecessary for Egypt, but likely prudent for the United States. I am apparently not on a watchlist of any kind (which isn’t a surprise) since I had an easy time in U.S. customs, but even if my phone wasn’t individually examined there are ways the U.S. government (as well as other entities) can scan your phone without someone physically touching it. Read Walter Kirn’s November 2015 article in The Atlantic, “If You’re Not Paranoid, You’re Crazy,” for more details on how these surveillance procedures were functioning two years ago. As time marches on, those methods and techniques are likely to become more powerful and widespread. My second phone tip, particularly if you’re in the United States, is to use TMobile as your mobile cellular carrier. We switched over several years ago and have loved the monthly savings, generous data quotas, and connectivity speeds in most areas. T-Mobile is also fantastic for international travel. I had included (no extra charges) unlimited cellular data as well as text messaging when I was in Egypt. This was FANTASTIC, and not only allowed me to use my Google Maps app everywhere but also update Instagram and Facebook with photos throughout my trip. Since phone calls were not free with T-Mobile, I opted to use the free app What’s App for both voice calls and videoconferences. This worked great to talk with family back in the United States as well as an Egyptian family friend with whom I needed to coordinate meeting times. As luck would have it, when we visited the Pyramids at Giza it was about 4 pm in Egypt, which made it about 8 am the previous day in the midwest of the USA. 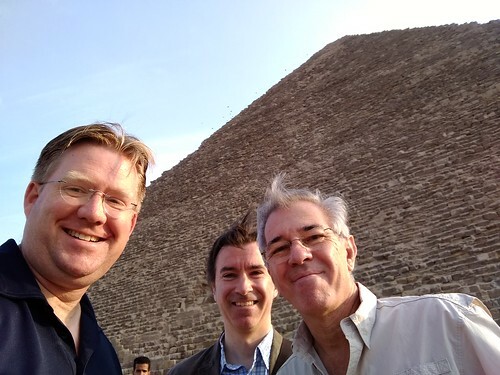 I successfully videoconferenced back home with my wife and youngest daughter FROM THE OVERLOOK by the pyramids, and it was SO cool to be able to share that moment with them LIVE. What’s App also offers end-to-end message encryption, which is a big deal and VERY positive. Without 4G/LTE cellular data connectivity I don’t think it would have been possible at all. What’s App was an invaluable tool for me on this trip and I’m definitely going to use it again when I travel of the country. We’re living in an “AI First” rather than a “mobile first” world, according to Google. I loved having both capabilities this week in Egypt, and used the Google Assistant on multiple occasions to convert currency amounts and answer other questions. I’d also like to reflect on some similarities as well as differences which this trip caused me to think about regarding politics in Egypt and the United States, but I don’t have time to share those thoughts now. These touch on the subjects of populism, democracy and the role of the military in preserving the republic. There are distressing parallels to the 2011 Egyptian “troubles” (Arab Spring) and our US Presidential election issues / current politics. More on these themes later! 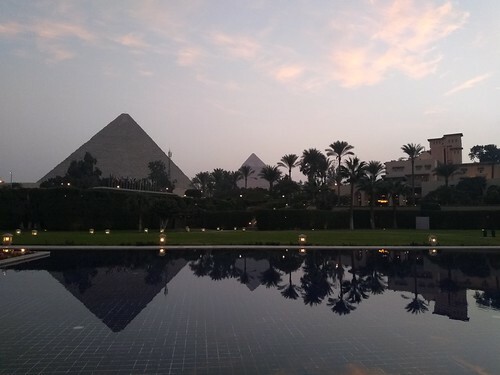 Overall, I had a fast and fantastic experience in Egypt! I hope some of these lessons learned are valuable and helpful to you as you plan for your own travel adventures. As a future teacher and avid traveler this post was very insightful. I had no idea all the access or checks the government could do at customs. In the past I’ve been a pretty low key international traveler when it comes to technology. I’ve never brought a lap top or personal cell phone on an international trip. All I ever had was a deactivated cell phone that I would use for maps and wifi. But I know as I get older and travel more, and with technology becoming cheaper and easier to travel with, I will likely find myself wanting to bring more technology with me. Your post is a great resource and I know I will be using many of the tips you provided. I know I will be encouraging my students to travel as much as they can, but I want to be sure I can provide them with safe and smart travel tips. Data privacy during travel is a completely new concept/issue to me and I am very glad I came across your post. It will definitely be a resource I use in my classroom to inform students how to keep their data and personal accounts private while traveling. I want to thank you for posting these travel tips about keeping your personal data private. I am a future teacher and avid traveler and find that these tips will be useful in my classroom to share with my students. I had no idea how much the government had access to while passing through customs. In the past I never carried anything more than a deactivated cell phone during my international travels. It is good to know what the government has access to while passing through customs because I know in future travels I will be more likely to bring a laptop or personal cell phone with information and accounts that I want to keep private. I plan to encourage my students to travel if they ever have the chance but I also want them to be aware of the concerns and safety and privacy they need to protect while traveling. As I encourage my students to travel, I will be sure to relay this information and your tips along to them! Thanks again for all these tips.